Can you imagine how hundreds of Handbells sounds like when played together? Join in with your family for our introductory about the music instrument! 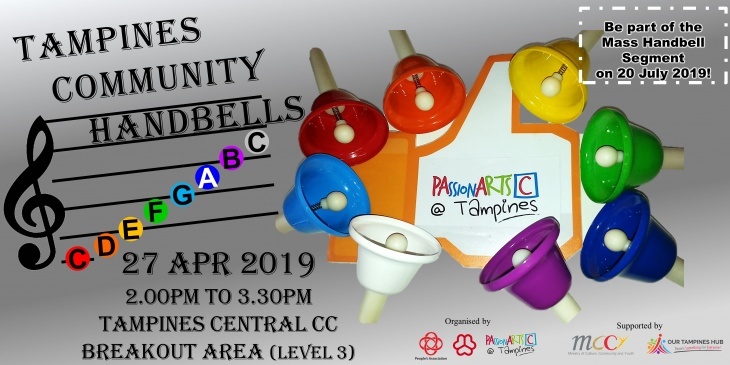 We have monthly workshops as a lead up to the Mass Handbell Segment during Tampines GRC PAssionArts Festival on Sat, 20 July 2019. Tampines Central Community Club is located within Our Tampines Hub, 1 Tampines Walk, Singapore 528523 and the venue, Breakout Area is best accessed via Lobby F.
27 April, See the website for the opening hours.